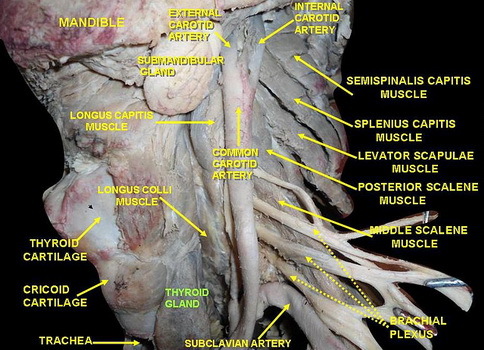 The thyroid gland is located on the anterior end of the neck and its function is to release thyroid hormones that play a role in the regulation of several systems including the cardiovascular system, digestive system, endocrine system, and musculoskeletal system. There are different causes of thyroid disorders. Iodine deficiency is one of the main causes of thyroid disorders. 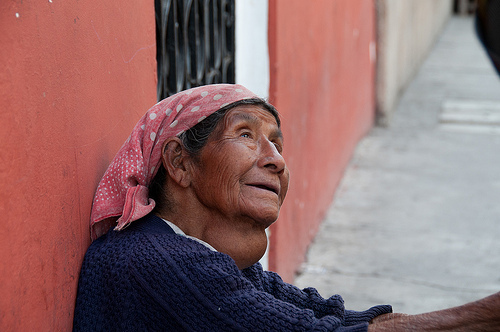 Goiter (a swelling in the neck due to the enlargement of the thyroid gland) is strongly associated with iodine deficiency. Grave’s disease and Hashimoto’s thyroiditis (autoimmune diseases) are also known to cause thyroid disorders. People who have undergone thyroid surgery in the past and those who have previously developed thyroid diseases are also prone to develop thyroid disorders. Abnormally raised levels of thyroid hormones (T3 & T4) in the blood due to over-stimulation of the thyroid gland is called hyperthyroidism. It is most commonly caused by a deficiency of iodine in the body. Hyperthyroidism is strongly associated with goiter. Insomnia, diarrhea, weight loss, tremors, and tachycardia are the most common symptoms of this disorder. Grave’s disease is a complication of hyperthyroidism that causes hyperthyroidism symptoms along with exophthalmus (outward bulging of eye balls) and lid lag (incomplete opening of eye lids). The initial symptoms of hyperthyroidism include mood changes, nervousness, sweating, thin and weak hair, and frequent bowel movements. An abnormal swelling in the front of the neck due to the enlargement of the thyroid gland is called goiter. It is located just below the Adam’s apple and is usually painless. However, a large goiter may compress nearby passages like the trachea (respiratory canal) and esophagus (food canal). Compression of these passages causes cough, aspiration, and dysphagia (difficulty in swallowing). In such cases, the treatment of choice is surgery. If the goiter does not cause invasive symptoms, it may be left untreated but you must regularly visit your doctor and get your thyroid function tests. It is recommended to add iodine-added salt into your diet if the goiter is due to iodine deficiency. Hypothyroidism is the insufficiency of thyroid hormones in the body. It is primarily caused by partial or total thyroidectomy (the removal of the thyroid gland). 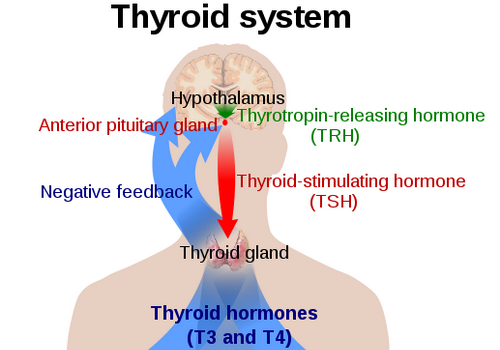 Patients who do not take thyroid medication on time develop hypothyroidism. It usually causes somnolence, constipation, weight gain, muscle weakness, and cold intolerance. It is strongly associated with Hashimoto’s thyroiditis. This disorder suppresses the normal function of the thyroid gland, causing a remarkable decrease in the thyroid levels. Patients suffering from hypothyroidism usually present with complains of anorexia (loss of appetite), constipation, depressed mood, loss of interest, fatigue, and somnolence. Thyroiditis is the inflammation of the thyroid gland. It can be caused by factors. Autoimmune inflammation of the thyroid gland and infections are the most common causes of thyroiditis. The inflammation of the thyroid gland can be painful or painless. In some cases, thyroiditis may cause thyrotoxicosis that may lead to an abnormal release of thyroid hormones. This is also one of the causes of hyperthyroidism. Thyroiditis is very common and is usually self-limiting. If it does not resolve spontaneously, medical intervention is required. Broad spectrum antibiotics are given orally or intravenously to prevent infection or bacterial invasion. Thyroid nodules are lumps that are formed in the otherwise normal thyroid gland. People who have a family history of thyroid nodules are more likely to develop these nodules. These lumps can be solid or fluid filled. The majority of these thyroid nodules are not serious and don't cause any symptoms. 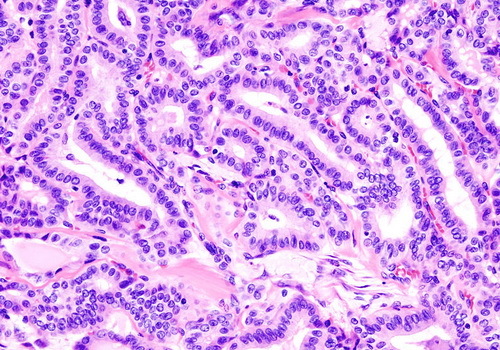 However, some of the nodules can be due to thyroid cancer. The nodules may be so small that may remain unnoticed by you. Such nodules are usually discovered by doctors during a routine physical examination. Some nodules may grow very large in size resulting in symptoms such as difficulty in swallowing, pain while swallowing, and coughing. It is very important to visit your doctor if you experience small nodules on your thyroid. Thyroid cancer is more likely to occur in women than in men. 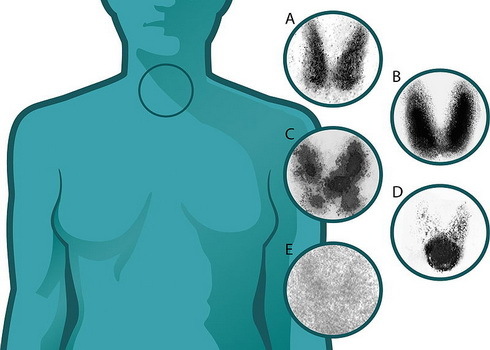 There are four different types of thyroid cancer. These types include anaplastic, follicular, medullary, and papillary. The exact cause of thyroid cancer is still unknown, but people who have a family history the disease are more at risk. Besides that, frequent exposure to high level radiation, being over 55, and some hereditary syndromes cause thyroid cancer. It is recommended that you get physical examination by your doctor if you have received radiation on the neck or any area near it. Women are more likely to suffer from thyroid disorders than men. The exact reason of this is still unknown but research shows that middle-aged women, women who are pregnant, or women who have delivered a baby in past 6 months are 5 to 10 times more likely to develop thyroid problems. Researchers believe that, based on the gender, women may inherit a genetic predisposition to thyroid disorders. Researchers have also explained that this is not likely to be due to the effect of the female hormone estrogen. Women should be very careful and should get a check up quite often. Thyroid disorders are most commonly seen in middle-aged and young women but anyone may develop this condition including newborns and infants. 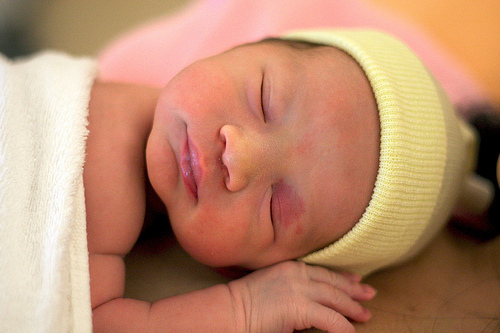 Hypothyroidism is a disease that is seen in newborns and infants. In rare cases, a baby is born without a thyroid gland or non-functioning thyroid gland. Such babies show the symptoms of hypothyroidism that include a puffy face, frequent choking, and a large protruding tongue. Thyroid disorders in children may show symptoms such as short stature due to poor growth, delayed development of teeth, delayed puberty, and poor mental development. If you notice delayed development of your child, you must visit your doctor. All thyroid disorders end up causing hyper or hypothyroidism. Hyperthyroidism in mild to moderate cases is treated with the help of medication. Propylthiouracil is widely used for the treatment of hyperthyroidism. Hyperthyroidism is eventually treated with surgery. There are 2 surgical options, partial thyroidectomy (removal of a part of thyroid gland) & total thyroidectomy (removal of complete thyroid gland). 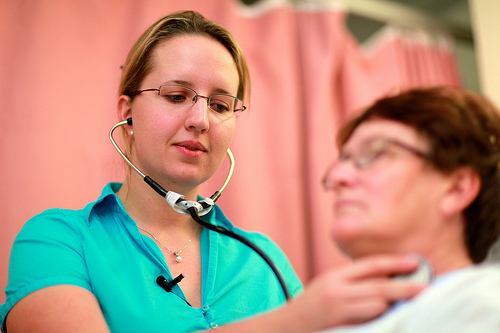 The patient is put on thyroid medication for their whole life after surgery. Hypothyroidism is treated with medication. Levothyroxine is given to the patients who have developed hypothyroidism. 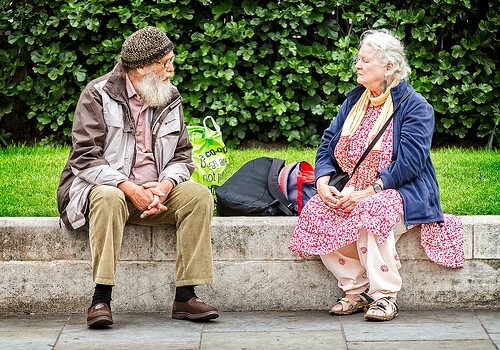 Such patients are completely dependent on medications. Skipping the medicine may result in severe complications. Do Thyroid Problems Always Have To Be Treated?